Looking good and performing well with the help of Terralift Fertilisers at Knaresborough Bowling Club. Pryor Hayes Golf Club started a full Terralift program this year, greens very soft and thatchy and some were disease ridden. Marked improvement already. 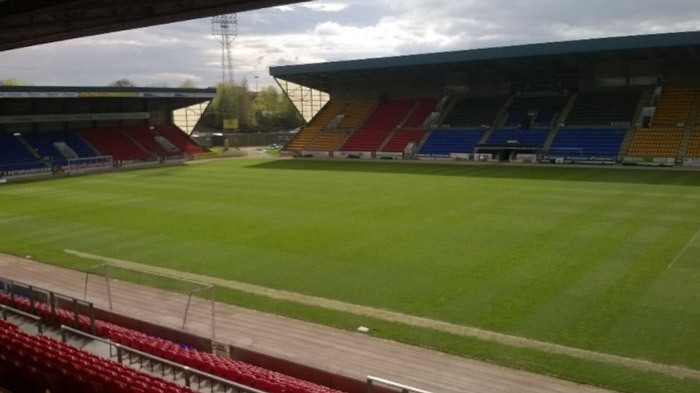 By using Terralift Sportsgrass 6-2-8, TX 5-1-20, Rocastem, Plantmax, Soilfix and Quadrop over the top of Scotts Sportsmaster CRF – the St Johnstone team have been able to train on the pitch from mid-January onwards. The pitch is now much drier and in better condition than it has been in previous years. Pictured, the 18th hole which was often very wet during the Winter months each year due to its unique shape. Since embarking on a Terralift granular programme, Rocastem four years ago and good greenkeeping, the green no longer closes. The picture shows the result of using TX10 early season. The site has been using a Terralift programme for three years and have achieved a National Championship venue status due to the improvement in the playing surfaces. Five year old green in Germany not using any Terralift products at time of photo. Fescue greens grow-in and post grow-in management on mineral only fertilizer programme. Significant ‘black layer’ presence, shallow rooting developing and tight thatch formation. Example of a USGA Spec, twenty year old green on Terralift programme at Esker Hills Golf Club in Ireland. Started a Terralift programme five years ago after the fescue grass surfaces became heavily polluted with annual meadow grass through conventional practices and materials. Now the greens have returned to almost 90% fescue dominance with annually only two micro-tine aerations a season and two over-seeding actions. The upper profile of the picture shows a reduction of ‘thick’ layering and indicates better moisture movement. Rooting within the green has increased significantly without organic matter build up. The improvement in the greens condition, better drainage, firmness, lack of disease, better colour, no artificial plant growth regulator use, very moderate top dressing use has been achieved using Terralift. The rate of over-seeding was restricted to a maximum of 30 bags of seed a year (20kg bags). Main Terralift products used are; TX10, Rocastem, Soilmax, TX9-1-10, Microflora 0-0-15 and T-Plex Granular 3-0-6. This great result was achieved by being able to limit excess organic matter production and recycle more of the plant produced organic matter each season, without having to resort to frequent aeration and top dressing thereby creating conditions more suitable for fescue establishment. This has been done in a high pH rootzone which is more difficult than mid to low pH environments. The 2 pictures below show the front of the 3rd green at Droitwich Golf and Country club. Severe dry weather and faulty sprinklers lead to dry patch on the front of the green which is on a slight slope. The bucket shown was filled with 10 litres of water and 75ml of Quadrop FS and literally tipped onto the surface. The picture below shows the same part of the green 6 days later. Please note that this was a site specific recommendation and use of Quadrop is subject to consultation with your local Quadrop representative.